Home another chance Hardik Pandya and KL Rahul sports Sports :Should Hardik Pandya and KL Rahul get another chance? Sports :Should Hardik Pandya and KL Rahul get another chance? 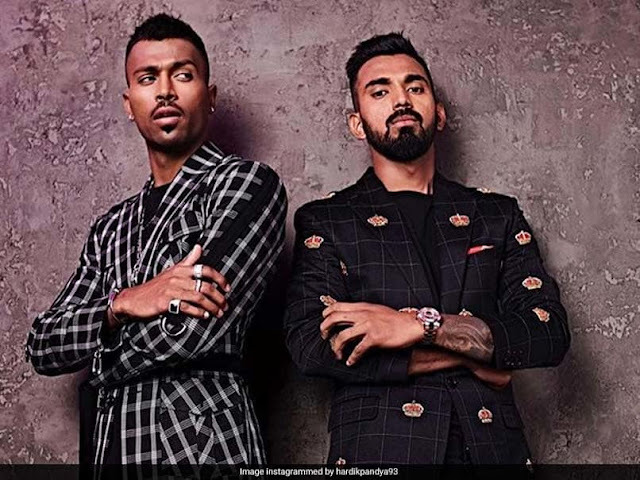 Appealing that another chance be given to Hardik Pandya and K L Rahul, who have drawn flak for their outrage-evoking comments on women during a chat show, renowned umpire Simon Taufel Monday said 'we all make mistakes'. Pandya, 25, and Rahul, 26, have been suspended by the Board of Control for Cricket in India and sent home from the tour of Australia following their sexist remarks in popular celebrity talk show 'Koffee with Karan', which is hosted by Bollywood filmmaker Karan Johar. Look what I would say in every team and in every business and every sport, is that good people make a good team. And that we all make mistakes from time to time. We all learn as we go," Taufel, 47, told reporters on the sidelines of a local cricket tournament where he was the chief guest. "Although, I didn't see the show, I have read little bit about some of the complaints. I have made plenty of mistakes in my career and I have learnt along the way." In the show, they spoke about hookups with multiple women and being casual about it even with their parents. "These players may have made some mistakes with some of the things that they have said. But they too will learn and all the other players and all the other people that have seen this event will also learn," he said. Taufel added that they have their careers lying ahead and remained hopeful they will come out of the incident as better persons. "I think we really need to be careful about being overly critical. People do make mistakes but if we learn from that and we are genuine about wanting to do better, and commit to doing better then that's a good thing." "These players have got their careers to get through like you make a mistake in the first ball but you still got the day to get through. And I am sure they have got some good people around them and some good advice." "I am sure they will come out of this okay and they will get through it. If they are genuine and they learn from that, I think they will become better as a result." Taufel, who recently gave a keynote lecture at Institute of Technology Bombay's (IIT-B) Techfest in Mumbai, stressed on the importance of education. "It's important that we invest in training and we invest in education. Because it is about the person as much as it is about the player. And it's a real challenge in modern sport where players are thrust into environments and opportunities that they have never seen before." And the amount the scrutiny that cricketers and umpires are on to these days, its huge." "My work going forward with a lot of businesses and lot of sporting organisations and a lot of people is about how do we prepare them for the challenges that lie ahead." Taufel lavished praise on Virat Kohli, singling out an innings in the 2012 CB series against Sri Lanka in Hobart, where the Indian captain made an unbeaten 133. "Every shot in the innings was in the middle of the bat. He was almost faultless," Taufel said. Taufel added that Kohli has now found out how to bring the best out of him and he is comfortable in being who he is. "Virat's now finding or has found what it takes to be a good leader. He grew up idolising Sachin Tendulkar and under the captaincy of Mahendra Singh Dhoni." "They have had a huge impact on his career. But Virat Kohli is his own man. He has found out what it takes to be the best Virat Kohli he can be," he concluded.